While Intel was announcing a high-end unlocked 8-core CPU based on its Haswell architecture last week, AMD was briefing the press on new unlocked octa-core CPUs of its own. But AMD isn’t making head-to-head performance comparisons between its latest FX-series processors and Intel’s top-shelf parts. AMD is competing on price, pitting its best CPUs against Intel’s second- and third-tier processors: the Core i5 and Core i3 series. 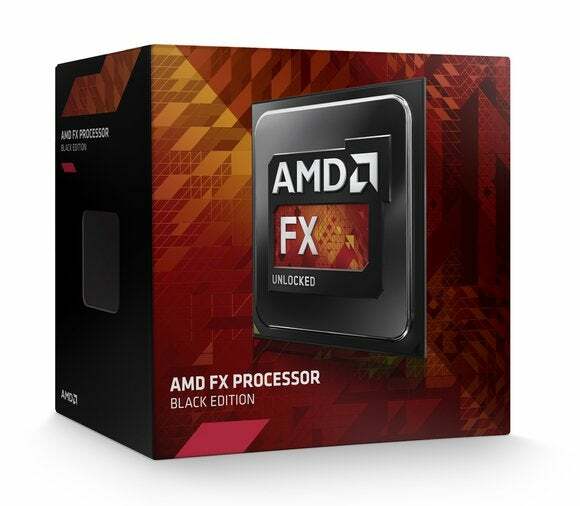 AMD announced three brand-new 8-core processors today—the 4GHz FX-8370 and 3.3GHz FX-8370E ($200 each), and the 3.2GHz FX 8320e ($147). AMD also reduced the prices on its other high-end processors, including its best—the FX-9590—which is now going for $230. Intel, meanwhile, expects to fetch $1000 for the fastest Haswell-E series CPU it announced last week: the Core i7-5960X. AMD announced three new CPUs in its FX lineup and a new lower price for its to-end part. AMD is focusing on two primary applications for its new CPUs: Content creation and gaming beyond 1080p resolution. But it’s also targeting budget-priced systems, describing an theoretical “enthusiast gaming PC” powered by an FX-9590 CPU, a video card with a Radeon R9 290X graphics processor, and 16GB of DDR3/2133 memory that would sell for $1499. AMD says a system builder could sell a “performance gaming PC” with an FX-8370 CPU, a video card with a Radeon R9 285 GPU, and 16GB of DDR3/1866 memory for just $1099. In the area of content creation, AMD says its eight-core FX-8370 and FX-9590 can significantly outperform Intel’s quad-core Core i5-4690K in tasks such as converting images from RAW format to JPEG. But time is money for professional photographers and videographers, and many of them might be willing to spend more cash up front to get more processing power from systems built around Intel’s higher-end Core i7 CPUs. AMD claims its FX-series processors are a better choice than Intel's when it comes to content creation. But they don't compete with anything beyond an Intel Core i5. AMD’s overall CPU technology is getting a bit long in the tooth. All of the company’s octa-core processors—including the three announced today—are based on the Piledriver microarchitecture it launched in mid 2012. The Steamroller architecture AMD announced earlier this year is limited to CPUs with a maximum of four cores. Where Intel builds its fourth-generation Core processors using a 22nm manufacturing processor, AMD still relies on a 32nm process to build it FX-series parts. And the fifth-generation Core processors Intel is about to launch are built using a 14nm process. AMD also lags badly on power consumption. Intel’s most powerful consumer CPUs, the Haswell-E series, have thermal design power (TDP) ratings of 140 watts. 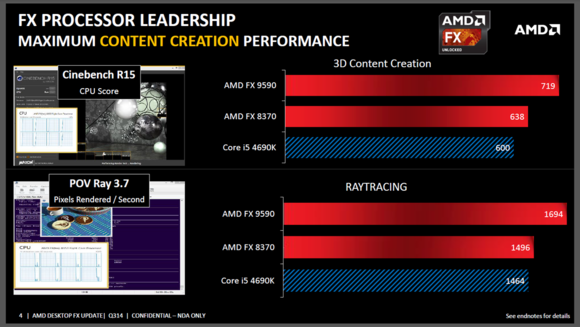 AMD’s best CPU, FX-9590, has a TDP of 220 watts. 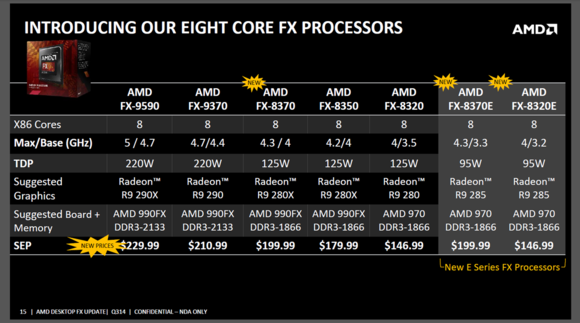 AMD’s new FX-8370 fares a little better, with a TDP of 125 watts; and its FX-8370E and FX-8320E both have TDPs of 95 watts. AMD sent us a motherboard and some sample CPUs late last week so we could run our own benchmarks. We’re building out a complete benchmark rig and will report soon on how the new parts perform.